In many electronic circuit applications a delay of a few seconds or minutes becomes a crucial requirement for ensuring correct operation of the circuit. Without the specified delay the circuit could malfunction or even get damaged. Here we discuss how we can make simple delay timers using very ordinary components like transistors, capacitors and diodes. Let's analyze the various configurations in details. The first circuit diagram shows how a transistors and a few other passive components may be connected for acquiring the intended delay timing outputs. The transistor has been provided with the usual base resistor for the current limiting functions. 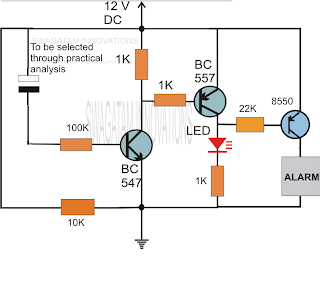 A LED which is used here just indication purposes behaves like the collector load of the circuit. A capacitor, which is the crucial part of the circuit gets the specific position in the circuit, we can see that it's been placed at the other end of the base resistor and not directly to the base of the transistor. A push button is used to initiate the circuit. 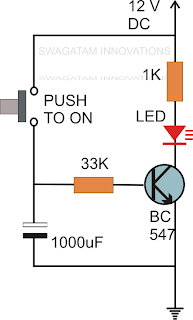 On depressing the button momentarily, a positive voltage from the supply line enters the base resistor and switches ON the transistor and subsequently the LED. However in the course of the above action, the capacitor also gets charged fully. On releasing the push button, though the power to the base gets disconnected, the transistor continues to conduct with the aid of the stored energy in the capacitor which now starts discharging its stored charge via the transistor. The LED also stays switched ON until the capacitor gets fully discharged. Te value of the capacitor determines the time delay or for how long the transistor stays in the conducting mode. Along with the capacitor, the value of the base resistor also plays an important role in determining the timing for which the transistor remains switched ON after the push button is released. However the circuit using just one transistor will be able to produce time delays which may range only for a few seconds. 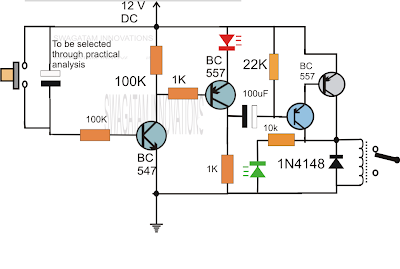 By adding one more transistor stage (next figure) the above time delay range can be increased significantly. The addition of another transistor stage increases the sensitivity of the circuit, which enables the use of larger values of the timing resistor thereby enhancing the time delay range of the circuit. The above circuit can be modified to produce a two step sequential delay generator. This circuit was requested by one of the avid readers of this blog, Mr.Marco. 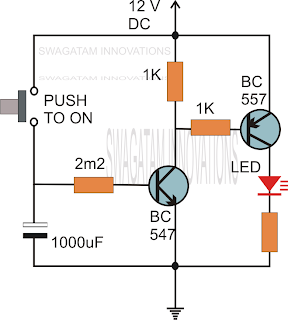 A simple delay OFF alarm circuit is shown in the following diagram. The circuit was requested by Dmats. 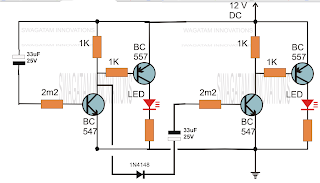 "I am looking to build a circuit that would control an output relay. This would be done in 12V and the sequence will be initiated by a manual switch. I will need an adjustable time delay (possibly displayed time) after the switch is released, then the output would go on for an adjustable time (also possibly displayed) before shutting off. The sequence would not restart until the button was pressed and released again. The time after the button release would be from 250 milliseconds to 5 seconds. The "on" time for the output to turn on the relay would be from 500 milliseconds to 30 seconds. Let me know if you can offer any insight. Thanks!" 0 Response to "Simple Delay Timer Circuits Make It Easy"